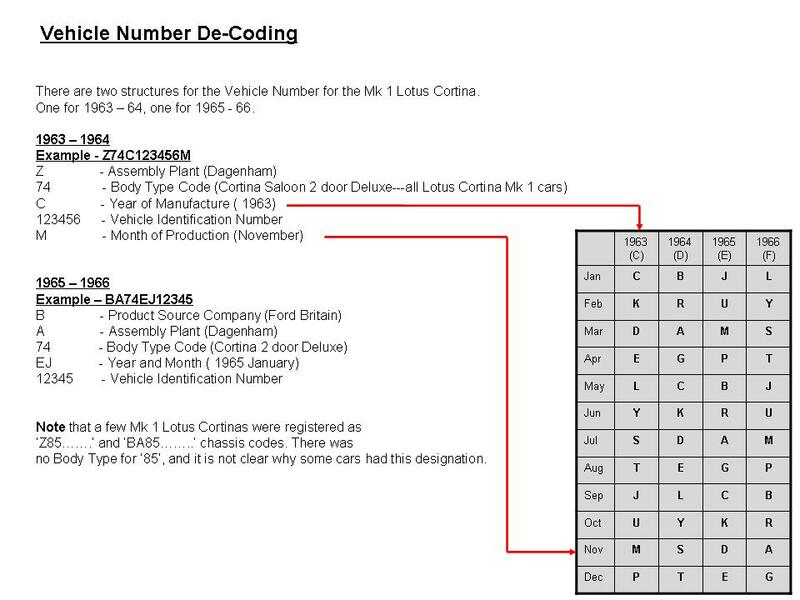 This section seeks to pull together the information required to identify a Lotus Cortina (from the Identification Plate and Body Tag), together with identifying the volumes of Mk1 Lotus Cortinas made. This is presented from information already provided in publications, especially the Ford Cortina Parts List, 1962 – 1966, and information that has been published by the LCR, for example, the register of cars published in the late 1990s. I have also collected information from forums and other publications, where such information has been verified. It should be noted that just because a car has the correct Identification as described below, it is not proof that the car is a genuine Lotus Cortina. Identification plates are only riveted onto the shell, and numbers can easily be stamped into the shell. If the car doesn’t have the right verification that it is a genuine Lotus Cortina, then you really have to know what you are doing before parting with your cash! Note that some folks get confused…is the Lotus Cortina a Lotus or a Ford? It is most definitely a Ford, largely designed and built at Ford’s plant at Dagenham, using mainly Ford parts or Ford sub-contractor parts. The car has a Ford Identification plate. The confusion arises as the car is commonly called the ‘Lotus Cortina’. Ford never called it that, but always had it as the Cortina (modified by) Lotus. But the press and indeed Lotus preferred the term Lotus Cortina, and that has stuck. And of course, the car had it’s final assembly at Lotus, and Lotus even gave it an identification of the ‘Type 28’, and that gave it the kudos needed to make a special car very special indeed! But looking at the identification information below, it is all standard Ford construct. There were two versions of the Ford Identification Plate used for Lotus Cortinas. The first is a square plate with the information set across the plate to give the square a diamond appearance in the car, used for the 1963 and 1964 production years. The second is an oblong plate, used for the 1965 and 1966 production years. The Identification Plate also contains other information, which identifies the specification of the car as built. There is a little more information on the later plate, although for much of this information the entry is ‘S’ for ‘Special’ for the Lotus. Note that this ‘supplementary information’ does NOT form part of the unique identification of the vehicle. That is, the colour of the car can be changed, and of course, the car can be changed from RHD to LHD, or LHD to RHD, without affecting the identification of the car. You can see from above that the body code for the Lotus Cortina is 74, which is the code for the Cortina Saloon, 2 door de Luxe – floor change. The Lotus shell was based on that body shell, so you have to be careful that a Vehicle Number with ’74’ in it does not mean it’s a Lotus Cortina! Although the Lotus Cortina was manufactured at Dagenham, with final assembly at Lotus in Cheshunt, it was a break from the norm for Ford to only partly complete the build of a car. Perhaps they just couldn’t bring themselves to give the Lotus Cortina a unique body Type designation, which had to wait until the Mk2 came along. The sequence number (within the RHD or LHD group). For example, a Body Tag with 436 RHD 37 is the 37th Right Hand Drive Lotus Cortina shell built. 436 LHD 342 is the three hundred and forty second left hand drive shell built. Note that this plate was used for production purposes, and does not form part of the unique identification of the car. As it is riveted on, it can easily be lost in restoration, or swapped over to another shell. There are implications for both scenarios! Trying to establish how many Mk Lotus Cortinas were made has been the subject of many debates, and the total number varies from 2894 to 3300. The lower number comes from Ford records, and the upper is from a combination of information from the only Lotus record left, the dispatch diary, and the extrapolation of information from the register held by the LCR. This is a combination of Body Code numbers, from the small oblong tag attached to the inner wing, and the chassis numbers, which for the 1965 and 1966 cars ws just a sequential number. However, there are a few factors to consider that may explain the differences. Firstly, there were many Service Shells made that wouldn’t have been included in Ford’s figures for cars made. They had a unique ‘Body Code’ just as a completed car did, which would just be the ‘next’ number in the sequence for Lotus Cortinas, with a different sequence number for Right Hand Drive and Left Hand Drive. Secondly, most Lotus Cortinas had the initial part of the chassis code as ‘Z74’ or ‘BA74’. There were quite a few that had ‘Z85’ or ‘BA85’ instead, and the reason for this difference is unknown. It’s also not known if the Ford lower figure includes the ‘85’ coded cars. Thirdly, Lotus record keeping can be unreliable. Lotus kept many types of record to convince the authorities that the target for homologation was being met, and to gain tax advantage with creative accounting. When production started (early 1963) the pressure was on to get ‘1000’ cars built for homologation, but it seems that as few as 200 – 300 cars may have been made in 1963. Production doubled in 1964, doubled again in 1965 and increased in 1966, probably due to the introduction of the left hand drive (Type IV) model. Despite the anomalies, the upper figure (rounded) of 3300 cars made seems to be the most accepted one. There weren’t many left hand drive cars made as they were not available until October 1965, with production starting at the end of August 1965. Some 160 were made for the North American market, with another 60 or so going to Canada. The total number of LHD cars made is around 660, but it is not known which markets, other than the North American market, they were sold to. The Special Equipment package was made available to give the cars a little extra performance and higher specification equipment. Officially, 68 cars were converted, but of course, considerably more than that had some if not all of the upgrades. It was a nice little earner for Lotus, and as an indication, more than 60% of Elans made were to S/E specification. One of the main considerations for having an ‘official’ S/E package or not was that the Ford warranty was invalidated by having it! Little wonder that most cars didn’t go the official route but had the modifications done quietly at the workshop in Cheshunt. It was intended to produce 30 ‘Production Racing’ cars for known racing teams around the world. However, 51 were produced. These cars were very close in specification to the Team Lotus works race cars. Breaking down the production numbers by type is also a very approximate exercise, especially given the anomalies of the number of cars made. In providing this breakdown, the 3300 total is used, and the analysis has been done by examining chassis numbers, and extrapolating numbers from known change points. However, it is known that leaf spring ‘prototypes’ were started to be built in February 1965 (the KPU cars) and in June 1965 (the GBP Police cars), and that some customer cars were built with leafsprings at Cheshunt before A Frame production officially stopped In August 1965. We will never know those numbers of course, but the number of leafspring cars made could easily be an additional 100 units on the numbers above, with the same reduction in A Frame numbers.